Join the discussion on our forums! Come discuss Moat Lurker over in our dedicated Moat Lurker discussion topic. would this card be actually usable if it was a higher mana cost (like 9 or something) and instead of summoning it to your opponent it summoned it to your side? No, that would make it infinitely worse. Anybody who thought this card would have been good in any deck aside from the nonexistent Evolve Shaman was a fool. Has anyone tried Moat Lurker with a Barnes battlecry 1/1 deathrattle minion? Does the Moat Lurker resummon a 1/1 minion or the deathrattle minion with its original stats? i know this is old, but it summons the original minion. For more information, see Disguised Toast's excellent video on the matter. Managed to use it 3 time in the same arena match, without getting the deathrattle tigard. 1-Returened with Youthful Brewmaster 2- Returned with Time Rewinder 3- Transformed with Recombobulator after that he conceded! Or any return-to-your-hand card. Shadowstep,the brewmasters, etc.. Double Sylvanas value, I swear this was waaay more useful than I was expecting! What would happen if a Moat Lurker ate another moat lurker that had already eaten another minion? Would you effectively duplicate the card since when the first one is eaten it releases the card and then killing it again after it gets out would re summon it? The second Moat Lurker will have 3/3 deathrattle effect only. And the summoned Moat Lurker won't have any deathrattle effect. Similar to Faceless Manipulator scenario. Yes, it copies the deathrattle and would therefore summon that minion again when the deathrattle is triggered. This also works with Unearthed Raptor. It does not, however, work with Faceless Manipulator, because the way its "copy" mechanic works is slightly different. 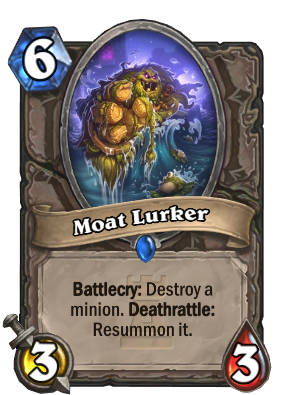 (With Faceless Manipulator you get a copy of Moat Lurker, but its deathrattle doesn't summon anything. Disguised Toast confirmed this.) Keep in mind that the minion that Moat Lurker summons goes back to the player who controlled it at the time it was killed... so you would only want to do this if you originally killed your own minion (e.g. Sylvanas). My favorite thing to do is to kill an enemy minion using Moat Lurker, then Shadowstep it. The deathrattle drawback is completely nullified, plus you now have a 4 mana Moat Lurker that you can use on the same turn as Sylvanas (steal a minion, plus get an extra Sylvanas when you're Moat Lurker dies!). Honestly, this card has been massively overlooked and underrated. It is easily one of the best cards of this expansion. It's crazy powerful when played correctly, it's a ton of fun, and it makes you think your turns through carefully and rewards thinking ahead and intelligent decision making. This is exactly the kind of card we need more of! You'll create a rip in the time-space continuum which could swallow up the entire universe. It would literally be the end of everything. If you have Brann and then play Moat Lurker, do you 'double-kill' a minion and is the deathrattle basically: re-summon minions that were killed by the battlecry (even two versions of the same minion), or is it somehow limited to one version? Or is it the same battlecry triggered twice which doesn't necessarily stack it? 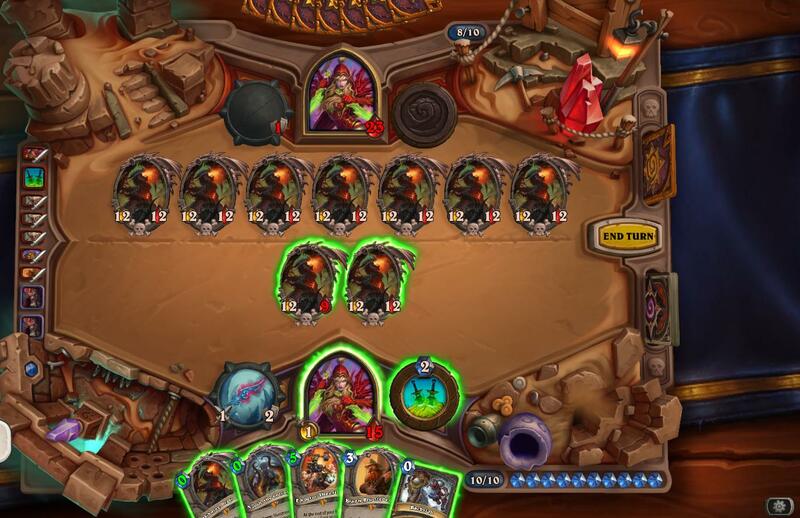 If you Brann with Blade of C'Thun then it's not like the second trigger doesn't work because the minion is already destroyed... it does not die until all is said and done..
My friend and I just did that. Brann Bronzebeard + Moat Lurker killing minion summoned only one copy. I believe the deathrattle effect can be increased by Baron Rivendare. Brann Bronzebeard + Moat Lurker + Unearthed Raptor and killing Unearthed Raptor summons multiple copies. Copying Moat Lurker with Faceless Manipulator didn't summon upon dying. N'Zoth, the Corruptor spawning Moat Lurker doesn't have any deathrattle effect. So if you plan to do some combos, make sure you have enough space for N'Zoth, the Corruptor to summon main deathrattle cards in end, and not 3/3 Moat Lurker with no effect. Interesting, thanks. :) Too bad though... that attributes are lost when e.g. N'Zoth, the Corruptor or Resurrect summon minions, I get... but unfortunate that Moat Lurker does not work that way - you can't see what it did as a buff like you can see it for Unearthed Raptor..
That's probably why rather than double-killing a minion not making sense. Played Moat Lurker and killed a minion. Moat Lurker and killed my Sylvanas Windrunner. Next turn Moat Lurker dead. Sylvanas Windrunner back on board. It was hilarious match. Also works when your minion has low health. Kill it and summon it back with full HP.